A typical shape of the culinary tradition of Abruzzo, made with 100% eggs from hens in barns, without water, bronze drawn and slowly dried at low temperature (in kraft paper package). 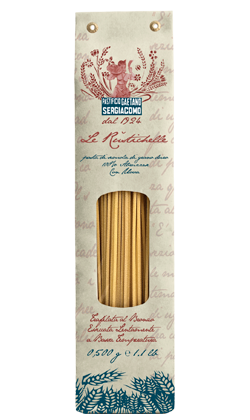 This type of pasta has a texture with an exceptional roughness, visible to the naked eye. We recommend it with some red sauces, such as Rustichella d’Abruzzo ‘alla Pecorara’, ‘Amatriciana’, ‘Ortolana’ or ‘alla Salsiccia’. Cooking time: 13-15 minutes. A typical shape of the culinary tradition of Abruzzo, made with 100% eggs from hens in barns, without water, bronze drawn and slowly dried at low temperature (in tube package). This type of pasta has a texture with an exceptional roughness, visible to the naked eye. 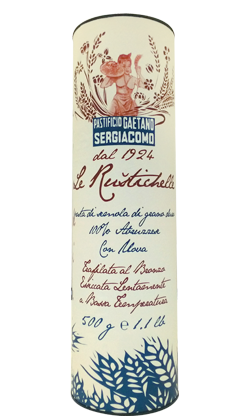 We recommend it with some red sauces, such as Rustichella d’Abruzzo ‘alla Norma’, ‘Bolognese’ or ‘Genovese’. Cooking time: 13-15 minutes.